Save Rock Creek Hills Park? Well, we sure tried! Rock Creek Hills Park has closed permanently for construction of a new Middle School that is scheduled to open in August of 2017. ‎"As we enter into a new site selection process for the new middle school, a priority is to avoid the pitfalls we experienced on the Rock Creek Hills Local Park site selection." - from Montgomery County Public Schools Superintendent Dr. Joshua Starr's memo "Site Selection Process for Bethesda-Chevy Chase Middle School #2". Board Rescinds Park Choice, Restarts Site Search. This evening, at the recommendation of Montgomery County Public Schools Superintendent Dr. Joshua P. Starr, who began in that position on July 1st, our Montgomery County Board of Education voted unanimously to begin a new site selection process for the second Bethesda - Chevy Chase Middle School, rescinding their April 28th resolution that had selected the site of Rock Creek Hills Park. We are confident that the new process will yield solutions superior to the site of Rock Creek Hills Park, which fails to meet the overwhelming majority of the specified site evaluation criteria. Good evening. My name is Lynne Kaplan, and I want to express my thanks to Dr. Starr, Mr. Barclay, and to the Board for providing this opportunity to testify before you today. I also want to thank you, Dr. Starr, for taking action to “restart the process in a transparent and inclusive manner”; this is a breath of fresh air! I value and encourage support for your request by Board and County Council representatives. We are grateful that you have recognized many of the significant challenges attached to the selection of the Rock Creek Hills Park site. I am a mother of two adult children who matriculated at public schools and speak now passionately about the value of learning in a diverse and welcoming environment. I am a professional facilitator who works with organizations you all know to help them explore complex issues and identify workable solutions. Disney, Nike, the NCAA, and the NFL are just a few of the clients I have supported through my business. I am a neighbor of the Rock Creek Hills community. The decision to “restart the clock” on the BCC Middle School #2 site selection process is greatly appreciated. The last process was flawed in both design and execution. Both the identification and the decision to select the Rock Creek Hills Park site were rushed and ignored many of the real restrictions that encumber the land. The Feasibility Study team actually reinvented the term. Staff said their job was not to figure out if a school was feasible but how to make it fit. This yielded a recommendation for a school that will be too small from day one, too expensive because of the costs associated with preparing the site, and created a potential legal landmine for Montgomery County due to inherent facility inadequacies and lack of parity. I believe a more transparent process is both possible and essential to address the needs of Montgomery County citizens. I support your recommendations outlined in the November 8 memorandum. I also urge the team to look beyond the existing sites to identify viable options that will fit the identified criteria. That said, I ask you to consider broadening your approach to develop a process that brings together qualified individuals to reexamine all the possible strategies for addressing the overcrowding of Downcounty schools. Given the dynamics of population growth, are there other options that would meet the need and manage scare resources effectively? Finally, I implore you to protect the Core Values and Best Practices that made Montgomery County a Malcolm Baldrige winner. The values you espouse demand that you take action to protect the racial and socio-economic balance of the BCC community. As a professional, one of my greatest pleasures is designing and facilitating leadership training for men and women who came from disadvantaged neighborhoods. For many of them, a quality public school education was one of the life lines that helped them break the cycle. All students need to learn in diverse environments so that they are prepared to live and flourish in our multicultural world. I want to thank you again for your visionary leadership and want to confirm our community’s intent to be of service to find the best possible solution for the children of Montgomery County. I’m here today as a resident of Rock Creek Hills neighborhood but foremost, as a mother of a third grader at NCC, to show my support for Dr. Starr’s recommendation to begin a new site selection process for BCC Middle School #2 with transparency, true community involvement, and viable sites that will include private partnerships. I applaud Dr. Starr’s leadership in recognizing a flawed process, and applaud the Board for recognizing the need for improvement within inter-agency communications, especially with Parks and Planning, and the County Council, both of whom are integral pieces to this complex puzzle. As many of you have identified, RCHLP continues to be a site with many challenges, ranging from a fee simple conveyance of part of the site that does not identify a reclaim right, to clarification on restrictions imposed by the use of federal funds (LWCF) administered through Program Open Space. The need for clarification has sparked three Congressional inquiries to the DOI and DNR. Although these challenges are the results of decisions made more than 20 years ago, it is reassuring that you as our educational leaders recognize the need to “cast a wider net on sites and on community engagement”, that goes beyond the role of PTAs. In that spirit I would also like to voice my concerns regarding the proposed elementary school boundary changes. As a member of that boundary committee, like Dr. Starr, I also voted for Option #5, based on demographics, enrollment projections and appropriate classroom additions for three schools: NCC with 8; BE with either 4 or 8; RHPS with 6. As a parent of a child at NCC I am very concerned with the current projected enrollment which out of all three schools, puts NCC at the highest capacity of 201% by next year, but yet its 8-classroom additions has been diminished to only a 6-room addition that will not accommodate a significant surge in student influx due to new boundary changes. I would implore you to review our decision based on outdated data and consider not only the enormous capacity levels at NCC, but also the detrimental impact of these boundary changes along socio-economic lines and the diversity make-up of the BCC community which contributes to the success of our cluster nationwide. As always, we are great supporters of all you do for our schools and the tremendous task you have in front that will be alleviated with true transparency and true community outreach to all stakeholders at hand. I applaud your forward thinking, integrity, and your pursuit to gather support by the community at large. My name is Teddy Springer and I am a resident of Chevy Chase View. I am here to applaud wholeheartedly Dr. Starr’s recent recommendation to reopen the site selection process for the new middle school in the B-CC cluster. It has not been an easy situation for all involved, with differing opinions and differing approaches. Dr. Starr has taken a difficult step and shown the community that he is willing to do the right thing. He has shown great leadership in doing so, and it is very much appreciated. Now I ask that the members of the Board continue this forward momentum by approving the Superintendant’s recommendation. I am also pleased to see that Dr. Starr has addressed many of my concerns regarding the Site Selection Advisory Committee. Reaching out to and including various stakeholders, soliciting various site options, and providing the public with the report (if no private property is under consideration) are all vital components in making an informed decision concerning the new middle school site. Equally important is that you direct MCPS staff to provide an objective analysis of truly viable sites, ones that meet your own criteria for a middle school complex, and to tap their creative side to identify options other than parkland. Naturally, my concerns with the size and adequacy of Rock Creek Hills Park and the cost of building the school there still remain. These concerns consistently lead me back to the issue of equity with Westland and the issue of socio-economic diversity. Our cluster has worked hard over many years to integrate various neighborhoods into the assorted elementary schools, and the caliber of B-CC High School is a testament to our success. I implore you not to turn back the clock and undo this hard-fought achievement by siting the school in a deficient location. A site more centrally situated will ensure the ability of the school system to keep the balance that has produced so many enlightened, well-educated students. I now look forward to a site selection process that will proceed with input from all affected groups and communities. I sincerely hope that MCPS staff will work diligently to provide well-researched, viable options and that they will think creatively when bringing ideas to the table. As a mother of children in MCPS and a member of the community, I pledge to do all that I can to help this process move forward in a positive and productive manner. And I urge members of other communities, and even those in my own community, with varying opinions to work together in a constructive, affirmative and respectful manner to reach the goal that we all want: a top-notch middle school in our cluster. So although I feel there are still issues that must be studied in order for this school to be built in the best place for our children and our cluster, I am hopeful that we are now closer to that end. So to Dr. Starr: many thanks for your good work. You have done our children and community a great service by putting a stop to the flawed process and giving us all the chance to do it right. And to the members of the Board: please proceed in this positive direction and approve the recommendation. By doing so, you will ensure that we will build a quality middle school at an appropriate site, something all parents – and taxpayers – want. "As we enter into a new site selection process..."
Good morning, Dr. Starr, Ms. Brandman, and members of the Board. My name is James Pekar, and I am here today to support Dr. Starr’s recent recommendation to re-do the B-CC Middle School Site Selection, as doing so offers a much-needed period of reflection and assures input from all affected interested parties. I am grateful that you are recognizing some of the significant challenges associated with the Rock Creek Hills Park site. Dr. Starr noted that all sites considered will be considered again. As I testified and Dr. Starr acknowledged, threshold issues exist regarding the availability of Rock Creek Hills Park for conversion to school use. Given the controversy surrounding the process up to this point, it is imperative that the status of the park be clarified in an open and transparent manner, with specific documentation available for inspection and analysis. For example, under the Maryland Code, conversion restrictions apply to land “acquired or developed” with Program Open Space funds. Absent is any language limiting enforcement of this restriction, which is noteworthy because, as you know, there is third-hand information indicating that DNR may draw such a distinction as a matter of “practice”. This lack of clarity, coupled with the fact that the only documentation found so far states that the park was developed with Land and Water Conservation Fund money, is what prompted the inquiries pending with the state and with the federal government. The statutory or regulatory provisions supporting any conclusions on the legal status of the LWCF and/or POS funds discussed. As always, we stand ready to assist the Board in finding a site that maximizes educational benefits to all students in this cluster. "A Wise and Considered Decision." On April 28th, our Montgomery County Board of Education voted to conduct a feasibility study for a new Bethesda-Chevy Chase middle school #2, to be located on the site of Rock Creek Hills Park. Precisely half a year later, on Friday October 28th, Montgomery County Public Schools Superintendent Dr. Joshua Starr released his Capital Improvement Program (CIP) recommendations, which included the construction of a middle school for 944 students, at an estimated cost of $46,485,000.00, to open in 2017, on the site of the park. No other information was available, as the feasibility study report for the project had not been made available, including in draft form. "In their opposition to the use of Rock Creek Hills Local Park for the new middle school the community has raised concerns over the process used to select the site and the suitability of the site for a middle school. The controversy over this site has spread beyond the immediate community. At this point I am concerned that we may not have the support of the Maryland National Capital Park and Planning Commission (M-NCPPC) — that is critical to having the property transferred back to the Board of Education — and of the County Council — who we need to fund construction of the school." "The use of Program Open Space funds was inconsistent with the reclamation terms of the transfer agreement under which the M-NCPPC took title to the property. This was the case since use of these funds places restrictions on future public use of parks, in contradiction with the terms of the original transfer agreement." "I am recommending that a new site selection process be conducted to review all sites that were previously considered as well as other candidates that may be identified through this process. In the next few days I will be sending a memorandum to the Board of Education outlining how the site selection process would be conducted and the timeframe for the study. The new site selection process for B-CC Middle School #2 will take advantage of the M-NCPPC/MCPS Joint Working Group that is exploring ways to improve site selection procedures." After Dr. Starr made his recommendation Wednesday night, Board members expressed support. Board President Christopher Barclay said "I think that this recommendation satisfies some real concerns that have been expressed." Board member Laura Berthiaume began her remarks by "commending the Superintendent on a wise and considered decision". In the days following, Montgomery County Council members Hans Riemer and George Leventhal expressed support, with Mr. Riemer praising Dr. Starr's decision as "a stand for integrity". We urge the Board to accept the Superintendent's recommendation to restart site selection, and we look forward to the Superintendent's memo on the new process. We are pleased that the M-NCPPC, which is the County agency with responsibility for land use and planning, will be involved. Our community is looking forward to participating an open, transparent, and fact-based site selection process that seeks a wide range of solutions to the needs of our children. We are confident that such a process will find better solutions than the Rock Creek Hills Park site, which fails to meet essentially all of the Board of Education's official criteria for a middle-school site. "I am recommending that a new site selection process be conducted to review all sites that were previously considered as well as other candidates that may be identified ..."
· Before we begin review of my Recommended FY 2013–2018 Capital Improvements Program (CIP) I want to take some time to address one of the most important capital projects I am recommending; construction of a new Bethesda-Chevy Chase Cluster middle school. · As you know, there has been a good deal of controversy since the Rock Creek Hills Local Park site was adopted by the Board of Education on April 28, 2011, as the location for the new middle school. · I have been concerned about the issues raised by the Rock Creek Hills community that have been most vocally represented by Mr. Jim Pekar. He and other members of this community are strongly opposed to construction of the new middle school at their local park. · In their opposition to the use of Rock Creek Hills Local Park for the new middle school the community has raised concerns over the process used to select the site and the suitability of the site for a middle school. · The controversy over this site has spread beyond the immediate community. At this point I am concerned that we may not have the support of the Maryland National Capital Park and Planning Commission (M-NCPPC)—that is critical to having the property transferred back to the Board of Education—and of the County Council—who we need to fund construction of the school. · At the same time as these concerns cloud the prospects for the new middle school, increasing middle school enrollment—and the need to reassign Grade 6 students from Chevy Chase and North Chevy Chase elementary schools to the middle school level—are pressing concerns of students and parents in the B-CC cluster. · PTA leaders in the B-CC Cluster are rightfully anxious to see the new middle school project move forward as expeditiously as possible. · I am sympathetic to the concerns of parents in the B-CC cluster, but I also believe we need consider the issues surrounding the use of the site and resolve these in a productive fashion. · Following are concerns over reclamation of the site, and concerns over the site selection process. · The transfer agreements that passed ownership of the Rock Creek Hills property from the Board of Education to the county, and then to the M-NCPPC, clearly stated that in the event the property is needed for public school use in the future, then it will be transferred back to the Board of Education. · This reclamation provision was important to the Board of Education’s action to adopt Rock Creek Hills Local Park as the site for the new middle school back on April 28, 2011. · Recently it has been determined that there may be more “strings” attached to our ability to reclaim the property for public school use. · When the M-NCPPC developed the park in the early 1990s they accepted funds from the Program Open Space (POS). This is a program managed by the Maryland Department of Natural Resources to distribute funds from the Federal Land and Water Conservation Fund to preserve open space. · The use of Program Open Space funds was inconsistent with the reclamation terms of the transfer agreement under which the M-NCPPC took title to the property. This was the case since use of these funds places restrictions on future public use of parks, in contradiction with the terms of the original transfer agreement. · We are currently conducting research on whether the restrictions may affect our ability to reclaim the Rock Creek Hills Park property. · Beyond the recently identified legal issue of reclaiming the park property, there is the lingering concern over the process leading up to adoption of the Rock Creek Hills Local Park site. · Staff has developed a detailed chronology of the site selection process, the Board of Education action, and the appeal to the Maryland State Board of Education. In addition, correspondence related to these matters has been provided to me. · I have been carefully considering the chronology of events, as well as the ongoing input from the Rock Creek Hills community. · I want to state clearly that I believe the process that was conducted leading up to Board of Education action on April 28, 2011, was conducted in conformance to applicable Board policy and school system regulations. · In addition, I have confidence in the recent feasibility study that showed how the new middle school can be constructed at the Rock Creek Hills Local park site. This study showed that nearly all of the current open space area can be preserved, including the play fields, and a state-of-the-art middle school can be constructed. · Although all of the appropriate steps have been followed, I have to acknowledge that there are enough issues still hanging over this project that additional steps are needed to firm up support for the new middle school. · I am recommending that a new site selection process be conducted to review all sites that were previously considered as well as other candidates that may be identified through this process. · In the next few days I will be sending a memorandum to the Board of Education outlining how the site selection process would be conducted and the timeframe for the study. · The new site selection process for B-CC Middle School #2 will take advantage of the M-NCPPC/MCPS Joint Working Group that is exploring ways to improve site selection procedures. This group began meeting on October 26, 2011. · My recommendation to redo the site selection process is not inconsistent with my CIP recommendation to open the new B-CC Middle School #2 in August 2017. There is sufficient time in this schedule to allow for the new site selection process and still open the new middle school by the recommended date of August 2017. "The notion that there is no other place to construct this school simply is nonsense..."
I am a parent of three children in MCPS schools in the Bethesda-Chevy Chase cluster, and I am writing to express my strong opposition to your staff's proposal to build a second middle school on Rock Creek Hills Park. Your staff's proposal for a second middle school at Rock Creek Park is a mistake for three reasons. First, this proposal will result in an unnecessarily expensive and inadequate school. Many other viable and less-expensive options exist to redress overcrowding in our cluster schools, and you have been mislead if you have been told otherwise. Second, we have worked hard in our cluster for racial and economic integration of our schools, and this middle school proposal threatens to unwind decades of success. At the very least, this proposal will exacerbate racial and economic disparity in our cluster, and for absolutely no good reason because the overcrowding can be addressed while maintaining our tradition of integration. Finally, we live in an increasingly crowded and urbanized area, and our park lands are precious resources that cannot be replaced. The unnecessary destruction of a heavily used and important park in this cluster is a more than a waste, it is unforgivable. The notion that there is no other place to construct this school simply is nonsense, and it demonstrates the fundamental failure of the site selection process to consider the full range of options to redress school overcrowding in our cluster. We ask that you take the time to give us, the parents of the children in this cluster, the opportunity to share with you our options for addressing school overcrowding in our area. This problem can be solved without controversy, without unnecessary expense, and without delay. Please do not approve this project for the CIP without at least taking the time to talk to those of us whose children will be most affected. "Children need both schools and parks." Due to the controversial nature in which the site selection took place for the BCC Middle School #2, I am writing to ask you to include a placeholder in the CIP for this facility and take some time to explore alternatives to Rock Creek Hills as the site for the new school. I believe MCPS and Montgomery County as a whole should exhaust all options for new school sites before considering parks. Children need both schools and parks. We are an overweight, sedentary society and we should not rob children of their neighborhood outdoor space because it's the cheapest or simplest option. Please select a more balanced site selection advisory committee and give them free reign to explore outside-the-box options for a new middle school site. The committee which chose Rosemary Hills/Lyttonsville and Rock Creek Hills Parks didn't explore options like reopening Lynnbrook Elementary School in East Bethesda (still in MCPS inventory) and shuffling elementary boundaries in a way that might allow either Rock Creek Forest or NCC to be renovated and become the new school. If Spanish Immersion were moved to Silver Spring International, this could work. It would also solve the BCC elementary school boundary dilemma by giving East Bethesda the true "walking school" they desire without re-segregating the mini-cluster. Chevy Chase Lake company owns land they would be willing to sell to MCPS for the new school. Yet, no one from MCPS or the site selection advisory committee explored this option. Perhaps land in the MCPS inventory elsewhere in the county could be sold to raise funds to purchase a plot of land in the down county for the new middle school. People keep throwing out the idea of building a "sixth grade academy" at Westland, an idea that should be further explored. Other options and creative ideas abound. Please allow our cluster the opportunity to provide ideas and don't take action to approve Rock Creek Hills Park based on the flawed site selection process conducted for this middle school. We need our green space in the down county - so much land is already paved over and primed for redevelopment. Please don't pave a park to build a school. Yesterday our Superintendent of Schools recommended that our Board of Education propose to our County Council that a middle school for for 944 students be built, at an estimated cost of $46,485,000.00, on the site of Rock Creek Hills Park. No other information is available, because the "feasibility study" report for the project has not been released, including in draft form. As considerable uncertainty exists regarding the availability of the site, such a proposal would not be prudent. Rock Creek Hills Park fails to meet essentially all of the Board of Education's official criteria for middle school sites; building there would be unreasonably expensive, fail to provide parity with existing middle schools, and violate respect for the rule of law. Before voting on the Superintendent's recommendation, the Board will hold hearings on November 10th & 14th; persons wishing to testify should call 301-279-3617 beginning 9:00 AM this Monday (October 31st). If the Board approves the recommendation, the proposal would go to the County Council, which will hold hearings before their vote in the Spring. An appeal to the State Board of Education, filed by the Rock Creek Hills Citizens' Association, is pending; the Association recently voted (96% to 4%) to continue opposition to this plan, by all reasonable means. NOW is the TIME to WRITE! The school Superintendent's capital budget recommendation is due this week, so please click here to let Dr. Starr and the County Council know that you oppose construction of a middle school on Rock Creek Hills Park. Clicking that link will open an email window. Please make any changes you want, and then please add your name and address at the bottom, before clicking "send". At his "Listen & Learn" event last night in Silver Spring, Montgomery County Public Schools Superintendent Dr. Joshua Starr said that the decision to build a middle school on the site of Rock Creek Hills Park would be "stress-tested". "Due to the location of Westland Middle School, at the extreme western side of the Bethesda-Chevy Chase Cluster, a site for the new middle school that is centrally located or closer to the eastern side of the cluster is desirable." The Site Selection Advisory Committee failed to respect the Board's guidance in this matter, as Rock Creek Hills Park is in the far northeast of the cluster. "The .... Board of Education standard for a middle school is 20 acres." Rock Creek Hills Park is a little more than 13 acres, including a steep creek-side slope that drops more than 50 feet, and specimen trees that would be lost to construction. "The existence of mature trees and steep slopes should be considered as these factors also could increase development costs or render portions of the site unusable. ... In addition to avoidance of steep slopes, ... as previously mentioned, credit is given for avoiding land ... that is designated as public parkland." Rock Creek Hills Park has specimen trees and a steep creek-side slope and is a public park! "The ... site should have access to a primary subdivision road, which consists of a 70-foot wide right-of-way. ... sites that have sufficient frontage to accommodate at least three points of access are preferred. ... A separate service drive is needed for deliveries. ... Community sidewalks are preferred to enhance safe student walking access to the school." Unlike several candidate sites eliminated by the Site Selection Advisory Committee, Rock Creek Hills Park lacks a primary subdivision road. None of the MCPS feasibility study options include three points of access, or a separate service drive. Community sidewalks are not in place. "A suitable site must have access to public utilities that include water, sanitary sewer, natural gas, electricity, and cable." Utilities exist, but are inadequate to support the proposed construction, and would require major upgrades. "Excessive noise, distracting activities, or hazardous industrial-type uses on adjacent land would not be conducive to education." Documents suggest that federal Land and Water Conservation Funds (LWCF) and state Program Open Space funds were used to develop the park; as a result, considerable uncertainty exists regarding whether conversion of the site is permissible under state and/or federal law. If the site is available, which is not clear, then it would be necessary to reimburse the parks department for development costs; these are not known. More importantly, under the federal act authorizing the LWCF program, conversion of the park to non-park use would require provision of land of equivalent value in the community. Crucially, because of the small site and steep slope, construction would cost substantially more (perhaps tens of millions of dollars more) on this site than on a more appropriate site. Finally, the "cost" to the community, and to the county, of losing the much-used park would be considerable. "What's most important to me, quite frankly, and what I've been working on with the team, is making sure our community, our funders, everybody, really understands how decisions are being made, because they are extremely complex and there are of course competing interests and demands. But if we step back a little bit and take a look at how decisions are being made, what the data are, so that everybody really understands what's happening, when, and why, I think folks will have great confidence in the capital improvement program (CIP) that we will be presenting in a few weeks." We agree wholeheartedly with this sentiment! The idea that the closer you look, the better we look, is a guiding principle of many professions, and is an always-appropriate aspiration for a public servant. The site selection process was found to have violated the state's Open Meetings Act. The site selection process appears to have violated the state's Education Act. Conversion of the site could violate state and/or federal law. "The MCPS feasibility study [proposed] a middle school that is too small to meet projected enrollment; to meet bus, faculty, parent and visitor parking; and to provide adequate playing fields. To accommodate 1,200 students will require expansion, which will increase costs and limit sports programs even more. The site does not provide parity with other middle schools in the county per MCPS requirements." A middle school on the site of Rock Creek Hills Park would be unreasonably expensive, fail to provide parity with other middle schools, and violate the rule of law. Its inclusion in the CIP would not be consistent with "great confidence" in "what's happening". "... we decided by a vote of 80 to 3 to continue our opposition to the construction of the proposed middle school on this site." This letter advises you of the results of the Rock Creek Hill Citizens Association's (RCHCA) meeting on Monday October 3, 2011. RCHCA residents attended to discuss the community’s collective response to Board of Education September 22, 2011 final feasibility presentation for the proposed middle school at Rock Creek Hills Local Park. At the meeting the electronic version of that presentation was available, as well as a handout summarizing the most important site layout and massing diagrams. Over the course of a one hour and twenty minute discussion period, the community discussed the site layout; environmental issues; the size of the school and its prospects for expansion; probable cost, traffic and safety issues; and environmental issues related to deforestation and storm water runoff. The basis for the discussion was the MCPS Staff presentations and comments presented at the feasibility study meetings. The size, configuration, utility, and equivalence of the physical plant, especially in comparison to other middle schools. The lack of sufficient space on the site to meet the long term needs of the County school system. Concern that the curriculum would not be as sophisticated as that at Westland Middle School. The high cost of the project estimated at 60 to 70 million dollars. The marginal nature of the athletic fields, again due to the constrained site. The fact that no option could be configured that would provide for the minimum number of parking spaces for a middle school, especially one expected to be expanded to its maximum capacity of 1200 students. Our concerns about the adequacy of this site for the proposed middle school are exacerbated by the loss of extensive recreational facilities in high demand and utilized by the broader community, including the two regulation soccer fields developed with state and/or federal funds. It should be remembered that, as noted by MCPS Staff, any school facilities likely will be secured and unavailable for recreational purposes to the community except for minimal times when they are not needed for school purposes. It is clear that there also will be severe, if not extreme, deforestation and strong potential for storm water damage due to the extensive grading that will be required for this site. For example, the existing playing fields will be dropped by four feet and at least two ten foot high retaining walls are required under any of the final options presented at the September 22 meeting. Buffering will be limited accordingly and will take several years to grow in to a point of effectiveness. Moreover, important information, such as the specific points of traffic impact, was not available before the meeting, and there has not even been a study of whether this is a safe community for a walking school. To summarize, the proposed middle school on the Rock Creek Hills Local Park would involve high cost, a risk of an inadequate educational program, and severe impacts on the County's recreational facilities and environment. These facts, coupled with the lack of critical information, even at this late date, caused the community to reject the feasibility study and oppose the construction of the school. It should be noted that as suggested by the Council and the County Executive the Rock Creek Hills Community participated extensively in all of the feasibility meetings before reaching this decision. Parks Director Mary Bradford said that construction of a middle school on Rock Creek Hills Park "would obliterate the park", and, as this video shows, Montgomery County Public Schools appears to agree that "... there's not going to be any trees left." Good morning, Dr. Starr, Mr. Barclay, and members of the Board. My name is James Pekar. I have appeared before you several times to speak against building a school on the site of Rock Creek Hills Park. Today, I’d like to suggest an area where, with your assistance, we may find common ground. As I testified here two weeks ago, a threshold issue exists for you, the county, and the state, in connection with the actual availability of the park site for construction of a school. 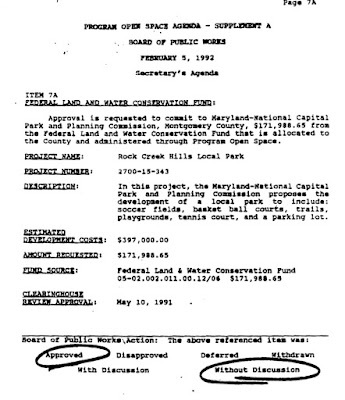 Documentation shows that, in 1992, federal Land and Water Conservation Funds were used to develop Rock Creek Hills Park. Under the law, parks developed with these funds may not be converted from park use without providing replacement land of equal value in the community. There is third-hand information that Program Open Space (POS) funding may also have been used here, and, if that is the case, restrictions similar to those of the LWCF may apply regarding conversion of the site. For this reason, and to ascertain how the Department of Natural Resources will enforce conversion restrictions, we wrote to the DNR Secretary soliciting his clarification. To date, we have heard nothing from the DNR Secretary on this matter. Regardless of how one feels about site selection, I think we can all agree that understanding the availability of the site is key to avoiding wasting time, resources, and scarce tax dollars pursuing an option that may not exist. Here's what we've done to help: In addition to contacting the DNR Secretary to seek to clarify the sources of funds, accompanying restrictions, and enforcement, members of our community are also reaching out to Governor O’Malley, to our federal Senators and Congressional Representative, to our state Senators and Delegates, and to our local representatives, to seek clarity on the status of the park. In the absence of the DNR Secretary's response, it would help the process greatly if you would reach out to these parties and seek their assistance to help clarify the situation. Doing so would be consistent with the due diligence that is required in any site selection, and in this case, it could help avoid enforcement actions or threats to future funding. Please know that we stand ready in this regard to assist you in any way that we can. My name is Teddy Springer. I am here once again to talk to you about the building of a middle school at Rock Creek Hills Park, to ask you to put a placeholder in the Capital Improvement Program and to explore the alternative sites for a middle school in our cluster. Last night, Dr. Starr, had you been able to hold your “Listen and Learn” event at B-CC, I hope you would have listened to our community and learned that to achieve a quality middle school, we have to start with a quality site. Rock Creek Hills Park is an A+ park, one used by many people from all over our county and beyond. But it is not a good site for a middle school. Though it was once the home of Kensington Junior High, the site is no longer the same because of the senior community that sits where the school once did. It does not provide the necessary space for a middle school on par with Westland. The topography poses a huge challenge to building on this site. The neighboring streets are too narrow, and without sidewalks, to provide proper and safe access to a middle school complex. The many valuable specimen trees and a watershed stream make this site environmentally significant. But most importantly, I hope you have learned that building a middle school at Rock Creek Hills Park is cost-prohibitive, for exactly the reasons I have just mentioned. The price to be paid by the county taxpayer would be considerably more than the price paid for other middle schools; yet the finished product would not provide the cluster with a middle school that would give our children an excellent education. Thus, there would be no equity with Westland. So please, Dr. Starr, let’s achieve “Starr” quality in our new middle school. Please put a placeholder in the CIP and advise the Board to continue the search for a middle school site, one that is an A+ site, not one that gets a failing grade. We recognize the enormity of your task, Dr. Starr, and the myriad of issues before you, but please honor the numerous requests my neighbors and I have made to meet with you. We want to work together to ensure our cluster continues to provide a gold “Starr” education for our children. At Monday's RCHCA meeting, someone said that only residents of Rock Creek Hills – but no one else! – would oppose construction of a middle school on the site of Rock Creek Hills Park. Ms. Lynn Amano, Co-president of the Rosemary Hills Neighbors' Association, testified recently before the county Board of Education, expressing concerns about the park as a location for a school. Ms. Amano's September 13th testimony is available online. Ms. Donna Savage, Chair of the Coalition of Kensington Communities, representing over 5,000 homes in 9 communities, wrote to Council President Valerie Ervin, opposing the Board's plans to build a school on the site of the park. Ms. Savage's July 22nd letter is available online. Ms. Caren Madsen, Chair of Conservation Montgomery, wrote to Board President Christopher Barclay, mentioning the "many stakeholders that take advantage of [Rock Creek Hills Park] year round", and urging a meeting with the Planning Board to find an alternate site. Ms. Madsen's June 14th letter is available online. The Montgomery County Civic Federation resolved that "... parkland should not be treated as surplus or vacant property... " The Civic Federation's June 13th resolution is available online. The proposed middle school would not be of the same caliber as Westland, and in particular, would not be an International Baccalaureate school. The proposed middle school would not have field space to accommodate multiple extracurricular sports at a time, as is possible at Westland. The proposed middle school would have, given its location in the far eastern side of the cluster, the potential to upend carefully calibrated efforts to integrate our cluster. The proposed middle school would be unreasonably expensive. The proposed middle school would destroy a widely-used park, including the fields used by the State Champion B-CC High School girls soccer team. "Because this site was acquired with public funds, and the outdoor recreational facilities (especially the ballfields) serve acute and irreplaceable needs in the area, the public should be permitted uninterrupted and perpetual use of the outdoor recreational facilities." "...what is actually at stake is the total loss of Rock Creek Hills Park." "While phrases such as '...construction of a middle school in a park...' may conjure images of a tidy schoolhouse set back in a bucolic green space, what is actually at stake is the total loss of Rock Creek Hills Park." - from our letter in today's Gazette newspaper. Rock Creek Hills residents vote overwhelmingly to continue to defend Rock Creek Hills Park. The Rock Creek Hills Citizens' Association tonight voted, 80 to 3, to continue to oppose the Board of Ed's plans to take the site of Rock Creek Hills Park to build a middle school. Come to the RCHCA Meeting on Monday! Come to the Rock Creek Hills Citizens' Association meeting Monday night! Help save Rock Creek Hills Park, Monday night, by attending the 7:30 PM meeting of the RCHA at the Grace Episcopal School, 9411 Connecticut Ave., Kensington. And don't be late; please plan to arrive early. A deeply flawed and secretive process led to the county Board of Education's hurried April 28th proclamation that it would take the site of the park from the Parks Department to build a middle school. At a May 17th emergency meeting, the Rock Creek Hills Citizens Association voted overwhelmingly to oppose this by all reasonable means; an appeal to the State Board of Education was filed, and is pending. A complaint to the State Open Meetings Enforcement Board was also filed, and on September 15th the State ruled that the county BOE's site selection process had violated the Open Meetings Act. Did you know that MCPS site guidelines calls for at least 20 usable acres, and Rock Creek Hills Park is only 13.2 acres? Did you know the current plan includes a projected student body of 1200 that would require portables and/or a substantial costly expansion? Did you know that this site does not provide parity with other middle schools in the county per MCPS requirements? Don’t let the BOE impact the character of our community without your input. Now is the time to ask MCPS for a quality education for our children. Join us at the meeting to learn more! Join friends of Rock Creek Hills Park on Monday night! RCHCA meeting at 7:30 PM. Soccer in Rock Creek Hills Park, 10/1/11. Good evening, Dr. Starr, Mr. Barclay, and members of the Board. My name is James Pekar. I have appeared before you several times to speak against building a school in Rock Creek Hills Park because new information just keeps coming up, information that, arguably, should have been addressed during the course of the site selection committee’s work. Today, I point you to potential legal impediments to the conversion of the park to school use that need to be clarified. There exists documentation that, in 1992, more than $171,000 was authorized from the federal Land and Water Conservation Funds available to the county to develop Rock Creek Hills Park. (You have a copy, attached to my written testimony.) Under the law, parks developed with these funds may not be converted from park use without providing replacement land of equal value in the community. We also have learned that the state Department of Natural Resources believes state Program Open Space funds were used for such development. Under the law, conversion restrictions similar to the LWCF apply. Understandably, people can disagree on the issues of parks versus schools, but now we are facing more than a matter of opinion. We have an issue of law, and the county’s and state’s obligation under the law. An incorrect decision here may trigger enforcement action and/or have an impact on future funding to this state. With such issues at stake, I ask that you, as stewards of the public’s resources, act prudently. Please halt activity in Rock Creek Hills Park until the provenance of park development funds and associated restrictions is understood, so that we may avoid inadvertently triggering a violation of law. 1. February 5, 1992 Program Open Space Agenda, Board of Public Works (page 7A). 2. August 31, 2011 letter from Mr. John Robinson, President, Rock Creek Hills Citizens’ Association, to Mr. John Griffin, Maryland Secretary of Natural Resources. "...that the Open Meetings Act was violated throughout the site selection process calls into question the credibility of the entire decision..."
"... [we] respectfully suggest that the fact that the Open Meetings Act was violated throughout the site selection process calls into question the credibility of the entire decision to select the Rock Creek Hills Local Park as the site for a new middle school for the B-CC cluster." - from the September 19th letter from Mr. John Robinson, President, Rock Creek Hills Citizens' Association, to the Maryland State Department of Education, being "a motion of Rock Creek Hills Citizens Association ... to lodge in this proceeding a copy of the September 15, 2011, opinion of the State of Maryland Open Meetings Compliance Board." Dr. Starr, please provide leadership to MCPS staff. A cursory review of the "minutes" released by Montgomery County Public Schools yesterday (September 20th) for the final (August 17th)* "working meeting" of the B-CC middle school #2 "feasibility study" reveals a misstatement of the facts. There was no vote defined as a "preliminary vote" (a term that appears in the minutes). A vote was taken, and the courtyard** option lost. Then, the facilitator, Mr. Dennis Cross, noted that there was a division between community members and MCPS staff, the latter preferring the courtyard option, and the former preferring the option with more green space. Mr. Cross asked the MCPS staff to explain their position. There was never any indication that a second vote would be taken. Given the hour (remember, this meeting was smack in the middle of a workday! ), people left. After they left, a second vote was called. Some people abstained from the vote; one voted twice; and MCPS staff held to their position. The MCPS-favored option won by one vote, despite the departure of community members. When Mr. Cross asked if the one-vote winner was the preferred option, community members noted the aforementioned circumstances, and it was agreed that, to be fair to those who had left assuming that voting was complete, both options would be described as preferred by the committee. Of course, the damage had been done, as equalizing the two options allows the MCPS-preferred option to be selected without being viewed as contrary to the clear vote of the committee. The "transition team report" recently prepared for our new Superintendent of Schools, Dr. Joshua P. Starr, calls for the "use of transparent processes to promote broader engagement." We call upon Dr. Starr to recognize that these events – like so much of what has transpired regarding Rock Creek Hills Park! – are contrary to that guidance. * That's right, minutes that were to be posted "within five days" of the meeting were posted more than one month later. **Another error in the minutes is the statement that with a courtyard, "more classrooms will have natural light". This is of course incorrect, as by law, all classrooms must have natural light. BREAKING NEWS: State rules that Montgomery County Board of Education's site selection process for Rock Creek Hills Park violated the Maryland Open Meetings Act. In an official opinion dated yesterday, the State of Maryland Open Meetings Compliance Board "... conclude that the County Board [of Education] violated the [Open Meetings] Act ... and that its site selection committee violated the Act in numerous regards." From page 5: "We conclude that the site selection committee violated the Act by holding meetings without giving notice to the public, by failing to keep minutes, and by failing to follow any of the procedures required of a public body meeting out of the public eye." "... we respectfully request that you clarify any restrictions that apply to the conversion of the RCHLP to non-park use ..."
Would Park Loss Violate Federal Law? Loss of the park would therefore appear to violate federal law, as Section 6(f)(3) of the Act authorizing LWCF states that "No property acquired or developed with assistance under this section shall, without the approval of the Secretary (Department of the Interior), be converted to other than public outdoor recreation uses." Thank you for the opportunity to speak to you on my community's behalf. My name is Lynn Amano, and I live in Silver Spring. I serve as Co-president of the Rosemary Hills Neighbors’ Association, representing approximately 300 houses surrounding Rosemary Hills Primary School. We are very concerned about two issues that you are considering in the coming weeks: Proposed boundary changes to Rosemary Hills Primary School, and the new Middle School #2 which is currently being studied for Rock Creek Hills Park. The committee that developed the boundary criteria for RHPS was made up primarily of residents from just one community, while the community surrounding the school went unrepresented. The resulting criteria were based almost solely on geographical proximity. Most of the resulting options would double the FARMS and minority population at North Chevy Chase Elementary and cut the same population at Bethesda Elementary by half. The new middle school planned for Rock Creek Hills is of concern to us for the same reason. The decision made to locate the new Middle School in the "Far North or East of the cluster" sets up a potential geographical divide along racial and economic lines in our cluster if proximity is used as a determining factor for attendance. The decisions to send Bethesda and Chevy Chase children to Rosemary Hills Primary School and Rosemary Hills children to Westland Middle school, while not geographically convenient, were put in place to balance our cluster and provide an equal education for all BCC students. The national ranking of our schools has shown this to be a successful plan. The Board of Education’s Quality Integrated Education policy stresses the importance of balanced demographics over geographical considerations. We respectfully ask that the Board not allow political pressure from a vocal, self-interested minority to undo the gains to all of our cluster’s students made through integration. My name is Teddy Springer. I am a resident of Chevy Chase View and a parent of two children in MCPS schools. I sit before you today to ask that you put a “place holder” for a new middle school in our cluster in the upcoming Capital Improvement Program. I have sat here before, I have told you my concerns about building a middle school at Rock Creek Hills Local Park. And you’ll forgive me, but my words may sound very familiar, because my message has not changed. My opinion was not altered during the feasibility study process. Actually, the meetings only furthered my belief that this site is not appropriate for the construction of a middle school. I will start with an example made clear to me Sunday night. My daughter is an eighth grader at Westland Middle School. Her Back to School Night is this Thursday, and Danny Vogelman, her principal - and an excellent one, by the way - made his usual Sunday night phone call to families. In his message, he talked about parking concerns for the evening. He warned parents that parking would be limited and suggested that we use the parking lot of the Giant located behind the school. What luck that Westland, which is built on 26 acres and yet still has limited parking, has a shopping plaza behind it. As I understand it, the plans for middle school #2 show a parking lot that is deficient in the number of spaces. What will happen at the inevitable evening events at the new middle school? Where will all the parents park? The obvious conclusion is that, because the architect has made many concessions due to the site size constraints, the cars will overflow onto the streets of Rock Creek Hills. And these streets are, in turn, too small to support the kind of traffic flow that results from school-wide events and are too small to be used as a parking lot. Rock Creek Hills Park is a heavily-used and well-loved park, not just by neighbors, but also by residents all over Montgomery County. But it is a small park, and sacrificing it for the building of a middle school does not serve our students well or use our tax dollars wisely. Because the site is so small, the architect has scaled back the size of the school. Therefore, MCPS will be providing a school that will be too small for its own projected numbers, calling into question the use of portables. This is not the way to properly provide for our children. Please, listen to the Parks Commission; listen to County Council members; listen to the people in our community. Do the right thing. Use a “placeholder” in the CIP. Because there are options to explore, there are other solutions, there is a way to serve your constituency and provide our children with a quality middle school. My name is James Pekar, and today I am here to ask you please to build a school that will meet the projected need for classroom space for 1200 middle school students. The school that MCPS staff propose to replace Rock Creek Hills Park is too small, and challenges associated with the site would not represent prudent use of taxpayer dollars. Consultation with the County Council confirms that it is possible to use a "placeholder" for a new BCC middle school in the upcoming Capital Improvement Program, and I encourage you to work with the Council to exercise this option. The process of developing the plan for the middle school has been flawed from the beginning, and appears inconsistent with your policies, your regulations, and state law. As Planning Board Chairperson Carrier has informed you, there may be state and federal impediments to conversion of the site to non-park use. The appeal pending before the State Board of Education raises questions about the availability of the site. Given these outstanding questions, a CIP proposal for a school on the site of Rock Creek Hills Park would simply not be prudent. Parks Director Bradford has said that a middle school would "obliterate" Rock Creek Hills Park, and offered: "We want to work to find a better way." Of course, the "better way" would yield a better school. Please, make the prudent choice, spare a small park that is very important to many Montgomery County citizens, and build a better school on a better site. Please, work with the County Council on a CIP placeholder, and work with the Parks & Planning Commission to find a "better way". "When the [Maryland-National Capital Park and Planning Commission] developed [Rock Creek Hills Park] in the early 1990s they accepted funds from the Program Open Space. This is a program managed by the Maryland Department of Natural Resources to distribute funds from the Federal Land and Water Conservation Fund to preserve open space. The use of Program Open Space funds was inconsistent with the reclamation terms of the transfer agreement under which the M-NCPPC took title to the property. This was the case since use of these funds places restrictions on future public use of parks, in contradiction with the terms of the original transfer agreement..."
– Dr. Joshua Starr, Superintendent, Montgomery County Public Schools. "[Montgomery County Parks Director Mary] Bradford said the Parks Department has long been amenable to sharing the use of sites with MCPS, but that the proposed middle school would leave no room for that. 'This is not a matter of finding a space where it works together with the park,' she said. 'It would obliterate the park...'"
The B-CC High School NAACP Parents' Council wrote that they "... cannot support the recommendation to build the new middle school in a potentially racially divisive and socially isolating location. ... We, therefore, ask the Superintendent and the Board of Education to decline to adopt Rock Creek Hills Local Park as the site for the new middle school." The Lyttonsville Civic Association wrote that "...MCPS staff set inappropriate boundaries for discussion... ...MCPS staff cut off discussion to insist that a vote be taken before the committee had finished considering all their options. Staff ... made procedural rulings that affected the ability of some representatives to speak freely. Some representatives voiced concerns that they were being led to a predetermined conclusion." Ms. Brooke Farquhar (Parks Department) wrote: "Costs were not thoroughly evaluated in the process and misinformation may have prejudiced the votes of committee members.... The process lacked a robust analysis. The potential sites should have been analyzed more thoroughly, based on detailed information that would allow consistent comparison across the sites." Mr. Frederick V. Boyd (Planning Board) wrote: "[T]he rating process used for selecting sites did not provide a real opportunity to consider the community character and quality of life consequences of choosing a candidate site. ... [D]escriptions appear to have been written to enable easier consideration of some public sites..."